karensdoodles: Freebie- Please don't share my images! Freebie- Please don't share my images! I have received many emails from loyal followers who have told me that people are sharing my images with each other. Some are purchasing them and others are receiving them as a Freebie and then sharing with friends or family to have a collection! I am sending this Freebie as a reminder that it is NOT OK to share my images with your friends! I have the names, blogs and addresses of EVERYONE who has either purchased an image or received one as a freebie. That email proves that YOU are registered owner of that image. When you received the email, I included my Angel Policy which clearly says that these images are for your PERSONAL USE ONLY and not to be shared with anyone. You can print out a few copies so you can make cards with your children or grandchildren, that's OK. But anything else is illegal and unethical. I am an artist and this is how I make my living! You are stealing money from me and other digi artists, when you share your images. It is also unfair to the many honest followers who DO purchase stamps from me. If this practice continues, I may be forced to stop selling my digi images rather than risk them being stolen. Digi stamps are a new concept. I really think people who are doing this don't understand the damage they are doing to artists by digi sharing. I believe there is good in all people- so please- if you have either purchased an image from me or received a Freebie and shared it, call your friends immediately and tell them to either purchase the image or delete it, before Monday. YOU are responsible for your own image. If you have received a shared image, purchase it NOW or delete it immediately. You must do this before Monday. People are purchasing images and I won't know the difference if you are a person who wants a new image or if you are "buying" your shared image. If you don't want to purchase your "shared" image then delete it and never use it again. On Monday, I will begin the process of seeking out illegal images. If you are caught with one you won't be able to join in Challenges or purchase images from me in the future. Is it really worth it? I don't think so but it is up to you. Also on Monday, all of you followers who still want me to keep drawing Bigsby and Herbert, please email me at kdfollowers@gmail.com when you see a card posted with my image. I will check it against my list of Stamp Owners to see if it is from a registered owner. With your help I hope we can bring an end to sharing digi images. Karen. I'm sorry that this is happening. That's an awful thing for your business. I hope that this helps you find a resolution to the problem. I have no idea why people would share images with their friends and family when all they are doing is breaking copyright law and obviously breaking your terms and conditions inc your Angel Policy which you've applied to your Digi Images. People have no common courtesy and I think its a shame that they'd want to steal from you, or other well respected artists. I hope this cute Bigsby gets the message across! I'm off to post him in my side bar, so hopefully people will be more vigilant and careful not to swap and share in the future. Its not like Digi images cost the world!! Hugs to you, cos I know that you will be deeply saddened to hear that you're Digi's have been abused in such away! Oh, Karen, I'm sorry to hear this is happening. I think if someone wants the freebie or any of your images they should come to you for it, the legal way. You have been so generous, thank you. I hope your little guy gets the message across. Sorry this is happening! Hopefully your gentle message will be enough, but unfortunately this day and time is usually isn't. Hope some don't ruin it for all of us. Oh Karen! I cannot believe people would do this. They surely know that this is not allowed! I hope they listen to you and delete the images and if not, I hope you find every one of them. Maybe you should make a wall of shame for these people so other digi sellers will know too. Most people wouldn't want to be on anything like that too, so it might give them the final push to do what is right. I am sorry to read that this has been and is happening to you over your images. I will certainly post your cutie pie above in my sidebar and spread the word so peeps know it is not ok to forward freebies or any others on to their friends. I do hope this stops! I am delighted with my freebie and the images I have purchased from you and hope that you dont have to stop selling them due to some others. I'm so sorry to read this Karen! can't believe people are really doing this. You gave them a great chance to get 1 freebie (also people who dont have a blog) so thats awesome and still they are trying to get more 'freebies',think thats very selfish! Karen.. I am so sorry this is happening to you.. that is just TERRIBLE!!! I can't believe that someone/someoneS would do that.. I will be on the look out for you also... THIS makes me SICK!!! I had someone hack into my 4shared account and STEEL all my digital images also.. So I TRULY know how you feel and I am so sorry for you.. I'm also sorry this is happening...I do hope those that know better feel ashamed for what they are doing...it isn't fair to anyone especially you since this is your living! And those that didn't know any better well I hope they take care of the issue right away by purchasing or deleting and know it is a lesson learned. I am very grateful for the freebies I have received..digital and rubber (I won some candy also) and I just hope people doing this illegal share do not ruin a good thing for the rest of us. I have seen sites stop giving freebies because of this problem and it is a shame for those of us that are honest! I am behind you 100% Totally understand and will do whatever I can to help you out. Big Mamma is on the Digi Force. Karen, so sorry to hear about this! And YES it is awful that people do not read Angel Policies! I rec'd your follower freebie Hebert and can't wait to use it on a card, and have gotten your other freebies on your blog, but would NEVER share any of them, I would direct them to your blog to purchase! And yes, it is just not worth it to do these typed of things. I will be purchasing alot more images from you soon:) Hope you get to the bottom of this! I will be using your "freebie" above and posting it on my blog as well! Oh Karen, I'm so sorry to read about this. It makes me so sad that people have to do this and take away the joy, yet alone income, from amazing artists such as yourself. I will post Bigsby up on my blog to remind people that this is not an acceptable practice. I really hope and pray it stops and doesn't prevent you from continuing to share your gorgeous artwork with us! i couldn't have said it better myself! some people just don't think. Good on you Karen, hope your image gets the message across and you can resolve this theft. OMG I am so sorry that there are people sharing your images,this is so wrong on all levels and I don't know how they cannot feel guilty about it.I will pop this on my blog when I get a chance and hopefully get this message around.I do hope that you can continue to share your amazing artwork with those that appreciate it and do the right thing. It makes me so mad that people steal images, especially since they just assume that once it's in their possession they may do whatever they want. The digital age has made so many things easier; unfortunately, that includes theft. I've taken your freebie and will post it in my blog's sidebar soon. I'm so sorry to hear this! Please don't stop doing digi's! I love your images! I printed my freebie out right when I got it and just loved coloring it, now I just need to make a card. I'll be sure to watch for cards with your images! I, like the others, am so sorry you are going through this! You are so generous with your freebies and your images are priced very reasonably! I can't understand why people would steal. :( Hope it all gets worked out, I love your drawings, please don't stop. I am so sorry this is happening to you that is just not fair!!! I can't believe it . oH, Karen I am so sorry to hear this is happening. I don't understand why people would do this. I just love your images and yes, my daughter does too (she chose an image I got from you out of a pile I put in front of her, to make a card with). I just hate that this is happening. Wishing you the best with your search! Take Care. Firstly - your images are gorgeous... you produce them at some rate and every one is a credit to you. I understand that you are creating digis as a means to a living and therefore, the practice of sharing digis is very frustrating for you... I hope this post helps... On the one hand such practice can be taken as a compliment but hopefully, when news of your post gets spread around, others will realise that sharing is not good when it comes to affecting another's livelihood. I am sure many of crafters who receive such 'gifts' do not realise the problems such a practice as sharing digis creates to folks like yourself and larger businesses and will understand why you have had to create this post. I am adding your freebie to my blogsite. You are totally doing the right thing reacting about it this way! I think (or at least I hope) most people don't do this purposely, they just don't use their heads when sharing, not taking into consideration the work you put into this. I only have one of your images Karen and it was a freebie for becoming a follower. I have only recently found you and think you have the most beautiful designs. Some other digi sites have very basically drawn images but yours are done with so much real detail and work. So it is so sad that people are doing this to you, I will surely keep my eyes open for any of this kind of activity. I hope people come to their senses and give you the deserved recognition you deserve. I hope you catch who ever is doing this and put an end to it! Your images are so worth the money... so why steal. It's especially discouraging when it's from a stamper... as a stamper myself, I know how much I cherish and love my stamps both digis and rubber or acrylic! I can only imagine how discouraging it is for you to have this happen to you! Hang in there Karen, you have lots of followers that will hopefully keep an eye out for you, as I will! Sorry forgot to say I've grabbed the Bigsby image to put at the top of my sidebar so all who visit my blog can see and remind them. You even made a lovely Bigsby for this reason! And yes, you're right!!!!!!!!!!!!! Take care!! 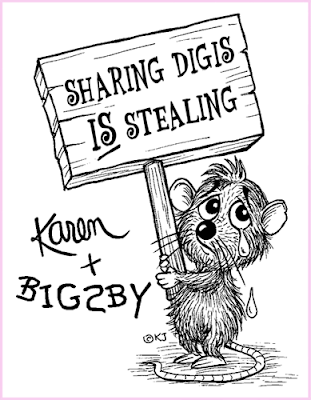 Karen I am new to the digi stamp world, but even I know your now overreacting. People sometimes just don't think. I am sorry you have to go through this. I will be purchasing soon, money is kind of tight. I will keep you in my thoughts and prayers. Just came over after seeing your message that someone had posted on Docrafts forum. I'm so sorry people are not being honest or fair. I've only just found your website (and received my follower freebie last week) and just hope that you will continue to produce the fab digi images. As someone has already said, many digis are quite basic, and I love the detail in yours that makes them much more versatile! That is so sad to read, I really hope its just people not understanding the principles of digi stamps. I guard my own stash of digi's zealously, as they are very precious to me. I hope you don't find to many breaking your copyright. I am really looking forward to receiving my follower freebie, which of course will be added to m stash. I'm so sorry this is happening. I just came across your site thru another that I visit. Your images are just wonderful! I plan to become a follower......the stamping world is full of wonderful people and I guess a few not so wonderful people. I hope this ugly practice comes to a quit halt. Digi stamps are such a great thing, I would hate to be without them! Here Here, totally agree. I wouldn't want you to stop drawing these great images, you are so talented. I have only printed some out big for my 5 yr old to colour in aswell as for me to colour in for card making. So sorry this is happening... I'm sure people don't realize how serious this issue is to the artist. Your artwork is beautiful! I am so sorry that there are people sharing your images, I don't know how they can not feel guilty about it. I will pop your special made bisby on sidebar with a link to this post !!! I think it is sad that in this community people are doing this and frequently. It isn't just the digis though. I've seen people stamping images and using them for give aways. Folks! These are copyrighted images you can't reproduce them like that. Lets all keep it honest. Well said Karen! I am so sorry to hear that. I really appreciate your artwork and your kind freebies. I like to make cards with your beautiful images. Hope everything will go all right with you. Today in my shop we talked about it with customers dat you can not share digital stamps with others... And now I read this! I'm so sorry to hear that some people just not understeand the value of you're work. I wish tou all the best! Thank you so much for saying what has needed to be said for a long time. As a DT member of 2 digi companies, I know that this goes on and I hate it. I'm posting your image on my blog, and I want you to know how much I appreciate it! I'm so sorry that this has happened to you. Hopefully awareness will stop the problem! So sorry to hear that this is happening to you. You are giving out freebies of your work and people are totally taking advantage by stealing! They will ruin it for others if they don't stop. I hope your message deters some people from stealing digi's. Karen, sorry your having trouble with the sharing issue, its beyond me why people feel the need to do that when there are so many images that you are giving for free or sites that are willing to let you try before you commit to buying. I hope your message gets across, Pen. Wow Karen, I'm so sorry to hear this. I pray this will get resolved. Really really unbelievable that people can do that. I hope you're able to catch these people. Keep on drawing, It all looks great! Aw Sorry to hear about this, I've been a bit awol lately! I don't know if people do that. I really hope is some mistake and everything will work out just fine. I find the image on this post so cute. I just want to buy it, if that is possible? Karen, I'm a big believer in sharing LINKS to freebies but never the freebies themselves. I will be adding your adorable reminder to my blog and I really commend you on creating such a cute way to get the message across! I'm so sorry this is happening to you, but I am pleased that you are actually standing up to these THIEFS! I APPLAUD YOU FOR STANDING UP FOR ALL ARTISTS!!!! I know you are have to be a bit more polite than the rest of us since this is a business, but I have NO PROBLEM reporting all of these low lifes that have nothing better than to ruin it for the rest of us! You have been more than gracious giving us these awesome images to use & these people & the ones that encourage this ILLEGAL practice should realize that they can & should be PROSECUTED to the full extent of the law! If you think this can't happen, why don't you ask the people that have mortgaged their lives to pay off Disney so they aren't put in JAIL!!! Some people may say that this is a form of flattery (sic), but it's not a mistake! Maybe other digi companies will also step up & enforce their copyrights, too. Maybe there should be a blog with just the names of the offenders like the FBI's Most Wanted lists. Let's call it the DIGI Offenders List or something like it! I just read on Ching-Chou Kuik's facebook page that companies are selling her items on CDs illegally, so PLEASE continue to be vigilant! BTW, I love your images so much that I actually BUY them! I personally have never visited your site before but so many interesting things on here. I am sorry to hear people are not complying to your Angel Policy on Digi's and as I love them I am going to put your freebie on my blog to let people know that I support you. I am now a follower to hope to visit again and maybe purchase some images when I get the chance to look through. Thanks for bring this to our attention. ah Karen this is too bad. I know that lots of gals share stamped images by stamping them off and sending the stamped image, but the digi world is so new to everyone and so hard to police. I LOVE your images and think that you do marvelous work. Please keep it up and know that you have a following that wouldn't dream of taking advantage of you or your work!! Karen , only just finding your blog and the lovely images you have and your little chap you have as a warning he will be going on my side i cant belive that people take other peoples work , being new to all this i will be very carefull what i do. Oh, wow. I didn't know this was happening. I do hope those people stop so others who do purchase and use the digi correctly will still get their chances at using them. I hope because of this you won't stop Karen. There are still lots of people who love your images and are using them in the right way. P.S. I hope you find those who are attaining them illegal and prosecuting them. Karen, Is it okay if I post this on my blog? I am sorry that this is part of what is happening, not just to you, but other digi artists. It was one of my original concerns!!! I so hope that you, and others, are able to continue with digi stamps and continue to earn a living doing so. Amiable post and this post helped me alot in my college assignement. Say thank you you for your information. Nicely put. I support you and other dig artists. You are correct it is stealing. What is it about 'bad apples'!? Karen, thank you for posting this! I am a fellow digi artist and have run across the same thing. I am nowhere near as popular as you on the digi scene; and because of this, I know offhand who purchases an image and who does not. It is a sickening feeling to see a creation made by someone who did not purchase or win the digital image they used. A great deal of hard work and time go into the creation of digis, and most of us try to price them fairly...which is why it is so very frustrating to see that they are being "given" away. Again, I thank you for bringing this issue to the forefront. I will proudly post your image to my sidebar with a link to this post. You are an inspiration to all of your fellow digi artists!!! Best wishes in resolving this ugly matter!!! I'm not a particular follower of yours - I've only just come across this site - but I could not agree more with you. There are thieves everywhere and they don't care what harm they do to any individual or industry because they are faulty human beings and care only for saving themselves a couple of pennies. Many of them don't have the brainpower to work out that they are killing th golden goose with their greed. Just short of remedial I'd say (..because I'm a generous sort..) and they're the same peeps who litter our communities and drive whilst using phones etc etc. There are a few peeps who genuinely don't realize what they're doing - they assume that because someone has given an image freely, it's theirs to give. I wish you well in your venture to stop these thieves - I try to educate where I can because ALL artists are at risk. Do you need to have a blog to get your freebie? Trouble sending an email for 400 Followers? Nutsy Fun - 6 Images in One!